Overnight, Most Rev. 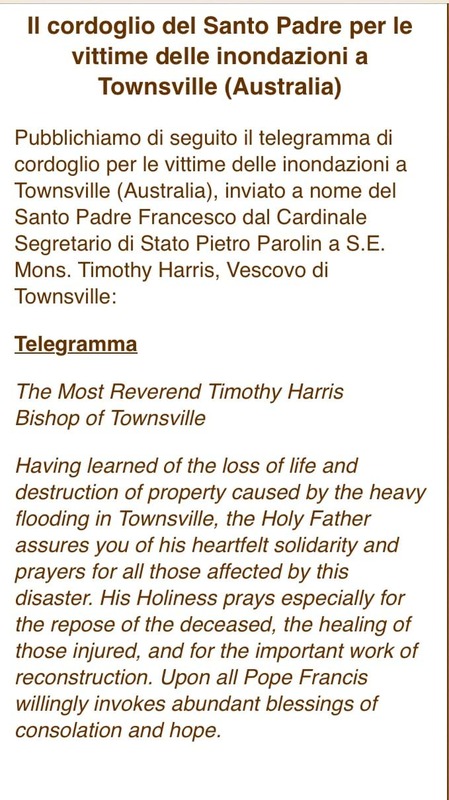 Tim Harris, Bishop of Townsville received a message from Cardinal Pietro Parolin, Vatican Secretary of State on behalf of the Holy Father, Pope Francis. Bishop Tim said it was encouraging that Pope Francis was aware of and praying for the people of Townsville especially those who have been affected by flooding caused by the recent extreme weather event. “Receiving this message should be a powerful message to all people in the community, knowing that Pope Francis is praying for all victims of this weather we have received in the past week” Bishop Tim said. Bishop Tim has also praised the efforts of the Townsville City Council, defence forces, Police and emergency services and the volunteers who have kept people informed and supported. “This is an amazing city, to see so many people out helping others is a powerful message to the community, we are all in this together” he said. Bishop Tim Harris will preside over the 10.00am Mass this Sunday at the Sacred Heart Cathedral with special prayers for the entire community as they continue to deal with the ramifications of the flooding.